We do puzzles at work. Not for work, but at work; to build team work, because we're a team; to bond !? (we're with each other 90% of our lives! ); mostly to take a break from the computer and our "real" work. 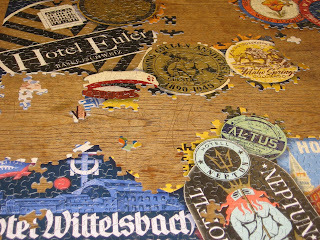 There are different puzzle protocols; some say you shouldn't look at the picture, it's cheating;some say you should do the frame first; there are those who just dive in and start putting pieces together; there are the strategists who plot out what part we need to work on first; then there is sorting the pieces, by color, shape. On March 3rd we will have a new department head starting. He's been told that we do puzzles, but will he remember? And, now he has the job, where as back then, at the interview, he might say anything to make a good impression. 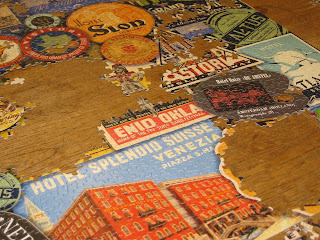 So, we are a little apprehensive about the future of the doing puzzles.